The Eastern Africa Grain Council (EAGC) has been developing and promoting Structured Trade in Grains and Cereals in the Eastern Africa Region. The components/building blocks of Structured Trade include, Grades & Standards, Post-Harvest Handling and Management, Storage and Warehousing & Warehouse Receipt System (WRS) and a Trading Platform. EAGC in partnership with Virtual City, a Kenya based IT Company, with the support of FoodTrade East and Southern Africa (Food Trade ESA) is enhancing regional trade by developing a private sector-driven structured trading platform called the G-Soko Platform that will engage smallholders. 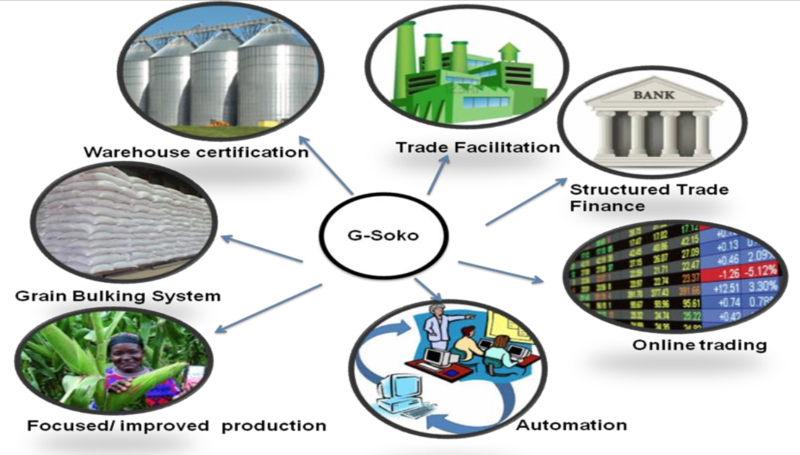 G-Soko links smallholder farmers to grain buyers across East Africa through a networked and structured market mechanism that utilises innovative technology to provide information on market opportunities, track goods, and connect buyers and sellers. G-Soko was launched this morning at an event in Nairobi, Kenya. The model has been based on tested market structures such as aggregation centres and certified warehouses, which store bulk goods, ensure quality and provide storage and credit facilities. This system also helps farmers to access finance and to source higher quality inputs at more affordable prices. The platform is making large gains in improving market access, enhancing productivity and helping farmers to increase production, employment and income. Provide efficient and transparent trade information that informs buyers and sellers on spot market conditions regionally. Opportunity to improve margins to farmers with market driven prices as a result of improved access to formal markets. 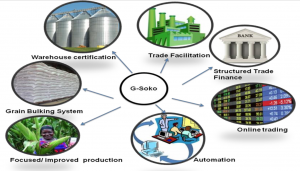 G-Soko platform guarantees availability of quality stocks. • Reduced need to carry out their own sampling to check quality, aflatoxins etc. Millers don’t have to buy and store all commodities at once at harvest season. Standardized and proven grading thus reducing need to carry out their own sampling to check quality. More reliable supplies of a known quality. Access to better markets-both local and regional. • Improved storage and handling facilities. Efficient and reliable trade information for decision making.